The EuroCup Final competition is Europe’s secondary level basketball tournament between professional men’s basketball clubs. The tournament is often called 7DAYS EuroCup for sponsorship reasons. We are currently in the middle of the 17th season of the EuroCup basketball tournament, which has become a great opportunity for young players to catch the eye of NBA scouts. The competition is organized by Euroleague Basketball and it has been sponsored by 7Days for three years. If you are a basketball fan or if your favorite club is one of the 24 teams that compete in the EuroCup, make sure to stay up to date on all scores and fixtures right here on xscores.com. We are slowly approaching the finals of the EuroCup basketball tournament. Unlike traditional tournaments, this event does not end with one final match. Instead, the finals are held throughout three legs. This season’s finals are scheduled to take place from April 9th until April 15th. Therefore, the first leg will take place on 9th of April, the second on 12th of April, and the third and last final match will take place on 15th of April. The semi finals of the tournament will determine which two teams will proceed to the final stage. Teams that qualified for the semi finals include Alba Berlin, Morabanc Andorra, Valencia Basket, and UNICS. 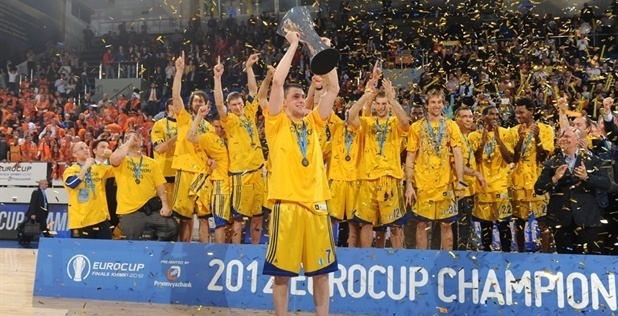 The EuroCup tournament used to be called the ULEB Cup but it has been renamed 11 seasons ago. Today, it is one of the most popular European basketball competitions that open many doors for young and talented players. All basketball fans can follow real time results and accurate fixtures and statistics on xscores.com. Stay up to date on all live scores and events within the tournament using your mobile or desktop device. With xscores.com you can follow live scores no matter where you are, as long as you have internet connection.